The road trip has been part of American history since Henry Ford began rolling out his Model-Ts in the early 20th century. Americans had a fun, exciting way to crisscross the country and see many new sights. While the road trip isn’t as strong as it used to be, it still holds a valuable place in American culture, especially with RVers. Road trips take planning but we don’t want to leave it all on you, that’s why we’ve come up with a fantastic Atlantic Coast road trip to let you see many of the sights and sounds on the eastern seaboard. This itinerary includes a description of the route as well as some of the more popular destinations most people like to check out and where you can stay at those destinations. Hopefully, this route and destinations are a great primer for an Atlantic Coast road trip. The Atlantic Coast was a huge part of early America and hosts many great settings and destinations, be it natural or man-made. For this article, we will start in the north at the most popular city in America, New York City, and wind down all the way to the Florida Keys. Your primary route will be Interstate-95 but there are many ways you can take this journey. That being said, let’s start with the first destination. I know, it’s not technically in New York but Liberty Harbor RV Park is literally across the harbor from Manhattan and all its attractions. This RV park has everything you’ll need such as full utility hookups, hot showers, bathrooms and laundry facilities and is located within walking distance of public transportation in the heart of Manhattan. That way you can leave your RV at the park instead of trying to blaze through New York City in a big old RV. New York City is full or major tourist destinations such as the Statue of Liberty, Times Square, and the 9/11 Memorial just to name a few so it’s up to the RVer to decide what NYC attractions are worth their while. Take a jog through Central Park, go see a Broadway show or try a famous restaurant. The options are endless in the city that never sleeps. 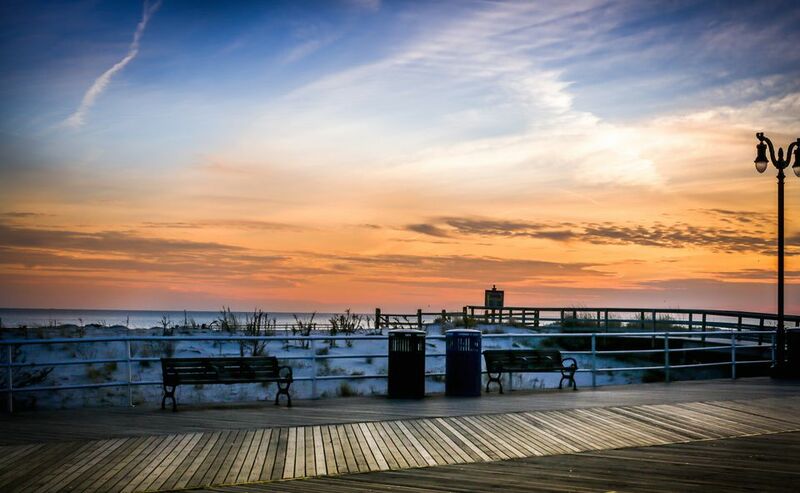 You won’t be in the heart of Atlantic City but a 10-minute drive in New Jersey is not too bad and you’ll be away from the hustle and bustle. The highly rated Ponoma RV Park includes shaded sites outfitted with utility hookups as well as fire pits to go along with the complimentary cable and Wi-Fi access. Showers and laundry facilities keep you nice and clean and you can stock up on supplies at the camp store. Other amenities and features at Pomona include propane refill, hot tub, swimming pool, playground and campground games like horseshoes. Atlantic City is like Las Vegas. You have casinos, live entertainment, and fine dining as well as the world famous Atlantic City boardwalk. Like New York, there are so many options when it comes to things to do, it just depends on what you like! Popular attractions in Atlantic City include Caesars Atlantic City and the Borgata Casino, as well as live entertainment at the Boardwalk Hall. Of course, don’t forget about the legendary Atlantic City Boardwalk where you can ride thrill rides, grab some unhealthy and delicious carnival food or just people-watch. Pit Stop: Ocean City, Maryland for some more boardwalk fun and world famous Maryland crab cakes. We featured this campground for our top five RV parks for North Carolina and not much has changed since then, it’s still a fantastic RV park. Camp Hatteras RV Resort and Campground offers sites are decked out with full utility hookups, private patios and even cable and wireless internet access. It’s a big an RV park but there is a total of five bath houses and four laundry facilities so you won’t be waiting in line long. You also have a general store for camp supplies and a private fishing pond for the kiddos. You have the entire Outer Banks of North Carolina to explore when staying on Hatteras Island. Some of the more popular areas include Jockey’s Ridge State Park, Pea Island Wildlife Refuge and you must pay your respects at the Wright Brothers Memorial. If you need to get out on the water, you can try some good old fashioned surfing or kitesurfing and, of course, you can’t forget about the many lighthouses that dot the shores of the Outer Banks. However, you look at it, Hatteras Island is a fun beachside locale for the whole family. KOAs have been an RVing park institution for years and the Myrtle Beach KOA is no different. You will get those famous KOA amenities and facilities such as full hookups, cable TV and wireless internet capabilities sparkling clean showers and laundry facilities, all nestled in this shady and lush park. You also get those extras that make this park more of a resort such as onsite fishing, group pavilions, pool, outdoor theater, wagon rides and more. If you like a park with a lot going on, you’ll love Myrtle Beach. The park is also close to all the action of Myrtle Beach, South Carolina. Within walking distance of the park, you’ll find amusement and water parks, mini-golf, live music venues, plenty of dining and the famous sands of Myrtle Beach itself. Attractions that shouldn’t be skipped over include Broadway at the Beach, Myrtle Beach State Park, and Ripley’s Aquarium. Golfers will also be happy to know that the local area hosts more than 100 individual golf courses so bring your clubs. You’ll be hard-pressed to find a better park in all of Georgia when compared with Skidaway Island State Park. This public park boasts 87 sites with water and electric hookups and 17 of those also have sewer connections if you hate draining your tanks. The park also houses restrooms, showers, laundry facilities, a dump station, playground and picnic shelters. It's a great park in a beautiful setting on Skidaway Island. Savannah, Georgia is a town that just oozes with southern charm. Begin with things to do right at Skidaway Island including biking and hiking trails, wildlife viewing, ranger guided tours or geocaching. Get into Savannah proper to enjoy some neat attractions and architecture such as the Cathedral of St. John the Baptist, the Bonaventure Cemetery or Forsyth Park. You can take guided city tours or even guided ghost tours to get a peek at the spookier side of Savannah. If you want simplicity, just take a stroll through the Savannah Historic District. Larry and Penny Thompson Park is a publicly run RV park and campground that has fabulous reviews. The unique layout allows you to park your RV in “pods” with plenty of personal space as well as the use of full utility hookups. The park is large with 240 sites but you shouldn’t have too much trouble with facilities as there are four distinct large restrooms, shower and laundry facility buildings. You also have your own freshwater lake, jogging and bike trail, water slide, camp store as well as picnic tables. Miami is an extremely vibrant community with loads to do, it just depends on your preference. If you like outdoor adventure, you can try hikes and guided tours through nearby Everglades National Park or Lummus Park Beach for something a little more intimate. Families will enjoy Safari Adventure or Zoo Miami. You also can’t forget about the world-famous nightclubs, restaurants and South Beach. Whatever your interests are, Miami has it covered. Did someone say paradise? Bluewater Key RV Resort is set in Key West with the perfect background of blue waters. RVers will be pampered with individually owned private sites outfitted with full utility hookups, cable TV, and wireless internet and surrounded by lush landscaping. Bluewater Key also has all the practical amenities and facilities you would ever need including hot showers, washrooms, and laundry facilities while also hosting a temperature controlled pool, direct water access, a camp store and a dog park. Like Miami, Key West is a town ready to party—and you’re invited. Popular activities include sport fishing and other on the water fun as well as boat tours of the Bay. The great outdoor adventure begins with Dry Tortugas National Park where you can scuba dive, snorkel or just walk around this beauty of a park. Popular landmarks and attractions include the Harry S. Truman Little White House, the Ernest Hemingway Home and Museum and the Key West Butterfly and Nature Conservatory. What a way to finish your Atlantic Coast road trip! The entire eastern seaboard can be pretty miserable during the heat of summer, regardless of how far north you are. That’s why it’s recommended to take this road trip when temperatures are a little cooler. Try late spring or early fall first but if you’re in a bind early summer will do as well. Avoid this road trip ​in July through August if you can. The Atlantic Coast is just full of historic landmarks, vibrant cities and varying cultures that leave you wanting more. If you want a great road trip that lets you explore varying types of locales and communities, the Atlantic Coast road trip is meant for you.